This pet has unique skin. This guy also drops Regal Hat of Stamina. Found around cords. 19-49 i think he has a 21 hour spawn? Only pet in the game that looks like this. Two weeks of obsession and I finally got him! 5:55 am, coords roughly 19,50. Server is Argent Dawn. I just saw him walking along, and freaked out. Abandoned bear. Ran up and tamed immediately. This has been by far the hardest tame I have ever made. He must have the life expectancy of a snowball in heck, as there is always at least one person out farming Mangy wolves. I stand for 1 1/2 level on the little hill and was hunting the other wolves around. Just some minutes ago (11:05 am) the "Old Cliff Jumper" spawned at 49,50. I still cannot believe that i have my new pet now. He's really beauty. For german ppl who want to create the macro, pls choose "Klippenspringer" for the target. That's the german word for the wolve. Does this guy have a placeholder, or a long spawn timer? I found him and tamed him. He is lvl 42 - doesn't look like any other wolf. Found him east of Aerie peak. Came with 1 add following him around. He patrols a circle around south and east of aerie peak. Easiest way to find em is to make a /tar Old Cliff Jumper macro. He has lots of armor so he is hard to kill and some health. Came with bite and dash. just saw him today. i like cats better, but does look like a sweet worg/wolf. Just got him, 2:45 AM server time. Very cool looking, i especially like his original skin not found anywhere else! Anyway, He didn't come with the howl, only dash 6 for me.. weird. anyone know his atk speed? I can't seem to find Old Cliff jumper anywhere my server is runetotem i've checked where it has been said to be found but still no luck does he have a spawn time? Got him last night after I turned 42 and read him up here. Went to the coords given on that map pic, put up beast tracking and used my ornate spyglasses for more tracking range and found him just a lil northwest. Came tamed with dash 2 and bite 6. I think I actually will use him over Humar. Furious Growl will probably prove more use to me since I run BG a lot. My warrior nearly ran him over near the mountainside just up from the hovel. I'd never seen him before or since. I love wolves and worgs so I brought my hunter over immediately. I have never seen him below lvl 40 is this info right? Another insanely lucky tame for me as far as rare spawns go. Didn't look for more then 20 mins. Does anybody have a picture of him? attk speed is 2.0, ran across him today and tamed him, nicer than my 'plain' wolf I grabbed a few days earlier. Congrats to thoes who have found OCJ, I have been looking for 4 days and no luck. On my server Silvermoon, this area has alot of traffic and until recently alot of bot activity. I would like to think he's spawned a few times but I haven't seen him. I've logged in at 3 or 4 am on multiple occasions, and tried the 4-6 hour after reboot trick an no luck there either. So Mugs up to thoes who have found OCJ, its time for this hunter to get some sleep. Caught this bad wolf just today. And im glad i found him ALIVE for once. Since i aready had broken tooth i killed him. Funny i always hating reading about people who just happened to walk up and find broken tooth, but thats exactly what happened to me. I knew he was special...but the first website i went to said he is known to drop EPIC items....so i killed him quickly. He dropped crap. Some captians gloves. he is the only one with this unique skin, i might get him for a good party pet, but im sticking with humar otherwise. edit: i Got him, good armor and O.K. DPS, keeping for party pet for the howl thing. anyone know how often he spawns? Man, does this guy even exist anymore? I really want to tame him, but everytime I look for him, he's NEVER there...I'm beginning to have my doubts about ever finding him. I heard smeone tell me his spaw is 21hours long... When i was getting Snarler i had to literaly sit at the comp. and wait for him, not just log off and on waiting, maybe it's the same for this guy? The map above is accurate though. On my server Ravenholdt it's basically impossible to get a hold of Old Cliff Jumper since there's an Alliance Farming Bot around that has the exact same route as OCJ's spawning area. 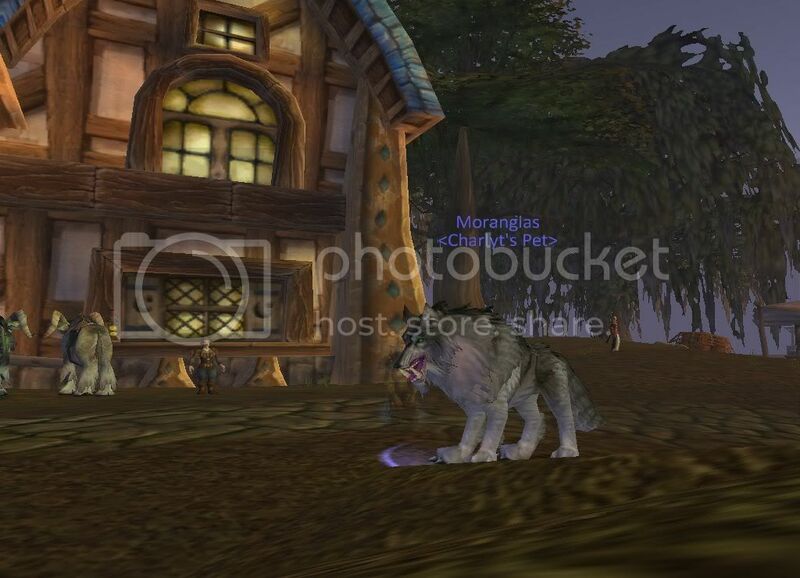 With 22 I had picked up Misthowler from Ashenvale, but even though the lean wolf model has much better animation than the worg, he was more like a boring grey dog to me than a real wolf. So I was camped in the little hut just south of Aerie Peak but at whatever day or night time I logged on, this Hunter was there along with her loyal pet "bear" and a lot of dead Mangy Wolves, grml. Well, killed her some and wrote a ticket, the usual stuff. I figured the only chance to get a hold of OCJ was to patrol the area for him to spawn which seemed almost impossible with him on a respawn timer of estimated 16-21 hours. So I gave up for the moment but the old hunter instincts soon returned and I logged off every day in the Hinterlands just to have a marginal chance to have him up when I would log back on and the Bot with some luck on the other side of the little valley. And, behold, this morning at around 11am he appeared on my radar on the southern side of the valley near the mountains. I jumped off my mount, did my preparations and started taming when exactly at that very moment, the Bot comes around the corner. Since OCJ wasn't tabbed from the taming process, he approached him while I was still on it and send his bear in. I immediately stopped the taming and in my desperation performed an aimed shot on the Bot hoping it wouldn't miss. Well, it landed on the NE hunter and I was able to take him down with about 26% left on OCJ. Took me 5 days to finally track this guy down but it was worth the wait as I think his unique skin looks awesome. 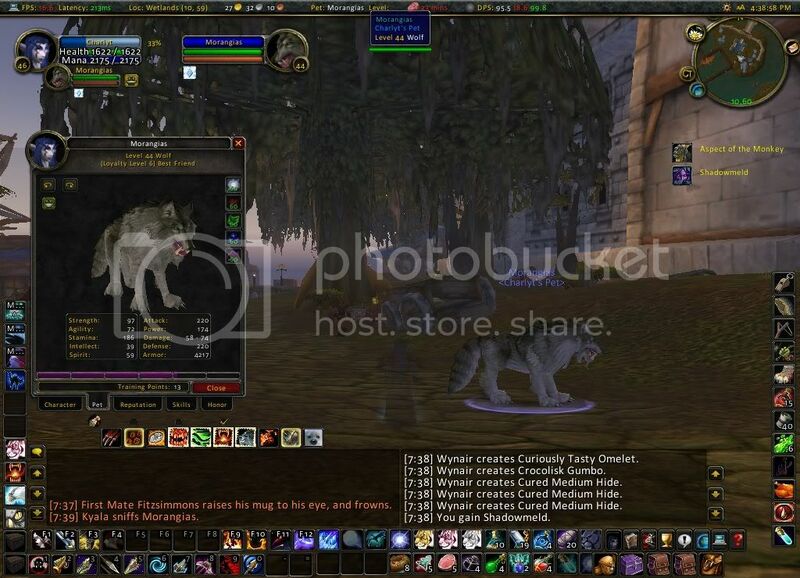 Tamed him at 9:30pm est after seeing a druid kill kill him at 7:30am est that morning. Hope this helps with people estimating spawn times. He came with bite rank 6 and dash rank 2. This wolf is a rare tamable spawn with a unique grey skin.